Across the world nearly one billion people reside in urban settlements with little or no access to sanitation, and with the rapid global urbanization that’s currently underway, it’s expected that 60% of the world will be urban dwelling by 2020. SOIL and fellow Container-Based Sanitation (CBS) practitioners are pioneering revolutionary sanitation technologies for growing global cities that – compared to traditional sanitation options in the cities where they operate – are safer, more resilient, and more sustainable due to the recovery of resources that happens through transformation of waste into valuable end products like Konpòs Lakay compost. 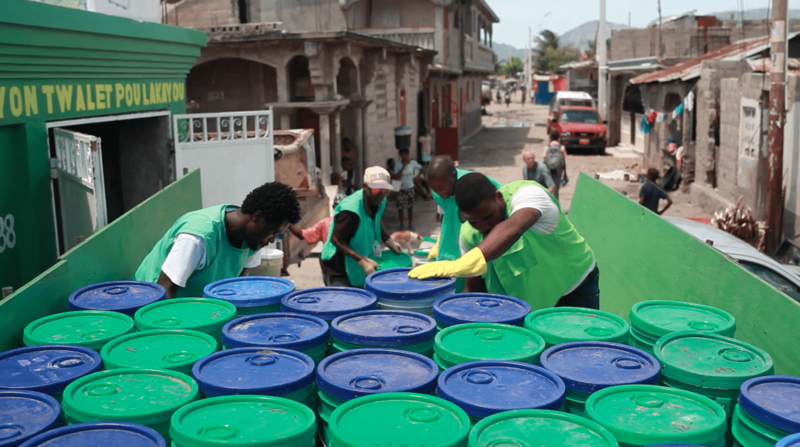 In a sneak peek to the upcoming World Bank report on Inclusive City-Wide Sanitation, which uses SOIL as a case study, the World Bank has released a new video that shares the story of our work in Haiti, alongside CBS Alliance members Sanivation and Sanergy. If you’re interested in learning more about SOIL’s inclusive sanitation solution, read the full article on the World Bank’s website by following this link. Are you inspired? Let us know what you think in the comments below and join the conversation online by using the hashtag #InclusiveSanitation. We hope you will keep a close eye on SOIL’s social media pages and our blog in the coming months as we await the release of this exciting new report. No Replies to "World Bank Video: A Peek into SOIL's Inclusive Sanitation Solution"